Making its public debut in the Carré des Horologers at SIHH 2018, the new FB1-R.6-1 regulateur from Ferdinand Berthoud is the second in the line of creations inspired by the eighteenth Century scientific engineer and Master Watchmaker, whose quite astonishing career was dedicated to the pursuit of solving the enigmas of timekeeping, precision and maritime navigation in the Years of Enlightenment, earning the endorsement of royalty, and charting his discoveries in self penned tomes which would become philosophic references in the development of horology. 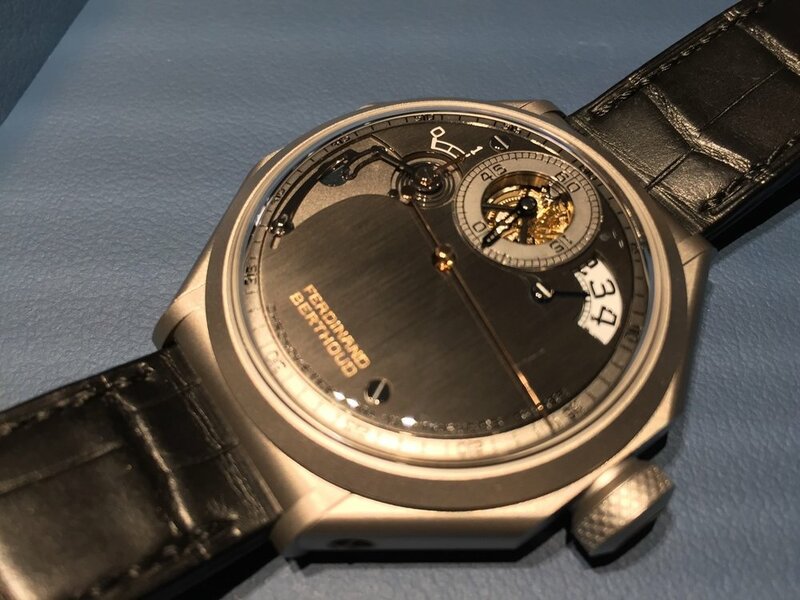 Fast forward to the twenty-first Century, and the fulfilment of personal ambition, fuelled by a passion for Ferdinand Berthoud's works and legacy, Chopard's Karl-Freiderich Scheufele re-introduced the Master's name, debuting its spectacular FB 1.1 Collection in 2015, and winning hearts, minds and indeed the Aiguille d'Or at the GPHG 2016 awards, with its uniquely distinctive octagonal profile, display configuration, and of course superb manufacture calibre with chain and fusée ensuring the constant force to energise the tourbillon to C.O.S.C. chronometric standards. Of course I jumped at the opportunity to go hands-ons with the FB 1R.6 in the company of the brand's Mr Cédric Laforge, to see how a centuries-old watchmaking philosophy has been combined with contemporary materials, manufacturing techniques and design to create this exceptional piece. A beautiful and strikingly different piece which connects two eras in horology, separated by the centuries, with its olde worlde marine chronometer charm and traditional watchmaking values, melded together with modern design and manufacturing processes, to create this outstanding and exclusive wristwatch. Presented in a carburised stainless steel case, which is remarkably scratch resistant thanks to the thermo-chemical treatment process, in terms of its design, the FB1-R6 shares the 44mm octagonal case style of its predecessor, including a pair of sapphire inspection panels on its side at the 2 and the 10, to observe the fascinating conically coiled chain within. Made in nickel silver with rhodium plating, the dial is slate grey in colour, with vertical brushed finish, and as a regulator, the hours, minutes and seconds are displayed individually, with the latter a slender and elongated gold pointer, in the style of historic marine chronometers, which sweeps around the dial, extending across to the outer rim and the seconds markings. A small, slightly elevated minutes dial with blued steel pointer opens onto the gearing inside, and next, the hour numbers are etched onto a sapphire disc which rotates above a white background, giving an interesting and pleasing shadowy effect. For the power reserve, the dial has been cut away completely through to the mainplate, and on it a coiled spring with travelling anchor maintains a constant tension, so the remaining or expired energy is always accurately displayed. It's really unusual and makes this little function stand out as a feature on the watch. As with its predecessor, the little sapphire panels on the sides are thoroughly modern touches and through them allow light to penetrate and flood over the chain and fusée mechanism which are suspended upside down, and comprising of no less than eight hundred individual components, its two transmissions defying gravity with only one fixed point each. The sapphire exhibition caseback reveals the tourbillon and the meticulously executed assembly of the manual winding calibre FB-T.FB.R. 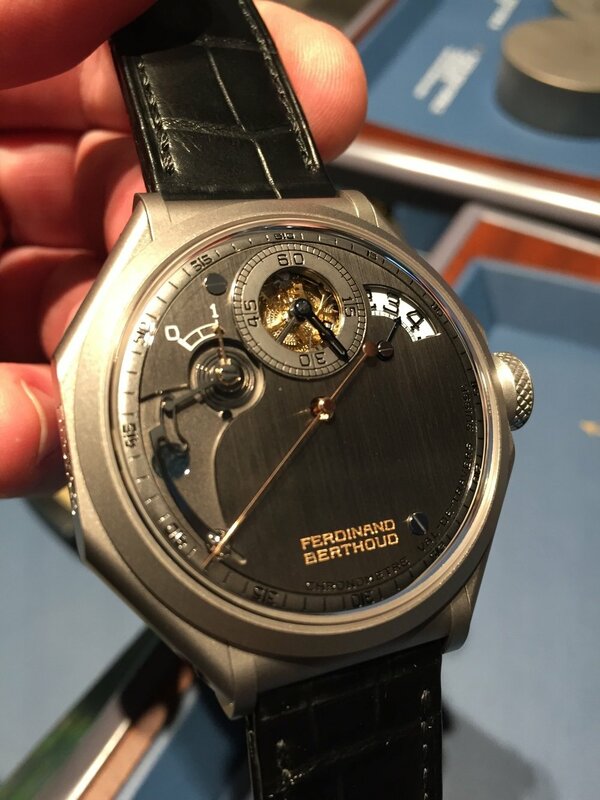 Entirely designed and developed at the Ferdinand Berthoud ateliers in Fleurier, the construction is true to the methodology of the time of the marine chronometer, with no fewer than eighteen nickel bridges holding the components securely, and front and rear plates connected by pillars around its edge. All in all, this is a very special wristwatch for the serious connoisseur, which celebrates the abilities and inventiveness of the horologic pioneers whose legacy paved a route from which virtually every aspect of the modern profession can be traced back. Only twenty pieces will be produced, and each one will have a price of €198'000.